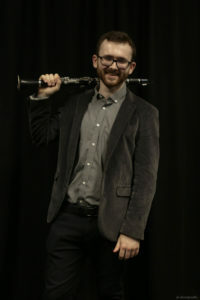 Cathal Killeen began his clarinet studies at age eleven with John Finucane at the Royal Irish Academy of Music, where he was awarded several annual scholarships. He was also the recipient of five High Achiever Awards for grade examination results, involving subsequent Gala Concert performances. During his time at the Royal Irish Academy of Music, he won the Senior Clarinet Feis Ceoil competition, and was awarded his Associate of the Royal Irish Academy of Music Diploma for Clarinet Performance in June 2015. Cathal subsequently graduated from the University of Dublin Trinity College with a Bachelor in Music Education Honours degree (Major in Performance) in 2017. He is currently a second year Master of Music (Performance) student at the Royal Conservatoire of Scotland where he studies clarinet with John Cushing. From a young age Cathal has been interested in the community spirit of orchestral and chamber ensemble playing, and as such has been a member of the National Youth Orchestra of Ireland, Dublin Youth Symphony Orchestra, Royal Irish Academy of Music Symphony Orchestra, Trinity Orchestra, Irish Youth Wind Ensemble and Royal Conservatoire of Scotland Symphony Orchestra. More recently Cathal auditioned for competitive internships and was subsequently invited to play with the Scottish Chamber Orchestra, Scottish Opera Orchestra, BBC Scottish Symphony Orchestra and Royal Scottish National Orchestra. Cathal also plays with the Knokkos Trio and this year the trio were the winners of the Dunbar-Gerber award for chamber music for their interpretation of the Brahms Trio in A Minor, Op 114. Additionally, he was awarded a scholarship to attend the 2018 Henri Selmer Paris Summer Academy, where he studied with Alessandro Carbonare, Michael Lowenstern and Guy Yehuda. Cathal has performed in many venues around the globe including Dublin, Liverpool, Glasgow, Edinburgh, Madrid, Berlin, Prague, Budapest, Austria, Miami and Michigan. He is delighted to be invited to perform in the prestigious Irish Freemasons’ Young Musician of the Year competition.